a-hole with a blog. 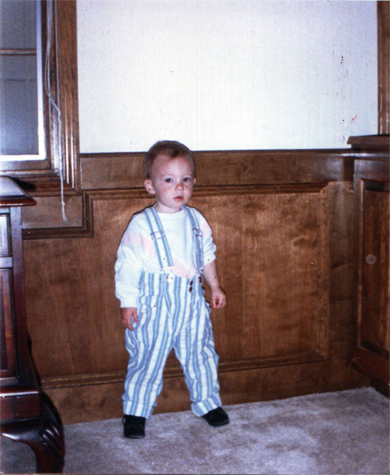 : I submit that I was the cutest tiny human ever. I submit that I was the cutest tiny human ever. So, I had this other awesome bloggy all planned out, but then I realized that my camera battery was dying, and by the time it was less-dead, it was too dark out to take pictures. Egads! I contemplated taking pictures with the flash, but it just would have looked gross. Anyway, I was wondering what else I could ramble on about in lieu of my Awesome Blog Post (it really is awesome--just wait and see. Or, be incredibly underwhelmed after all of this anticipation, JUST like when The Golden Compass was made in to a feature length movie and you waited and waited for your favourite book to make it to the big screen and when it finally did, you were so angered that you shouted at the screen as the credits rolled. Yeah, just like that. Except it won't be, because it's awesome!) and . . .
Where was I? 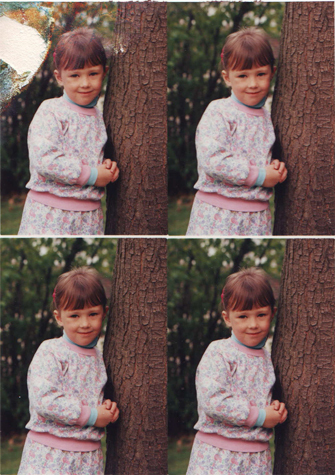 Oh, right: I was cleaning out my desk drawer and found some smashing pictures of me when I was a much tinier human. And since I had my scanner handy, and these were all super cute pictures, I thought to myself, "You know what: everyone else out there needs to see these pictures too. And now you have something to blog about." Here is that something to blog about, which I am fairly certain is way more awesome than the Julia Roberts movie, Something to Talk About. Although, you're free to talk about these pictures too. And you'll probably want to. Because they're cute. And stuff. Apparently, when I was little, I wore a lot of coveralls. 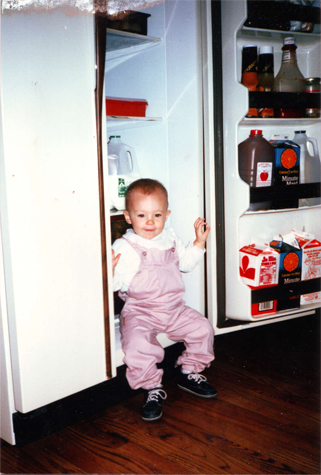 I also thought I was meant to be refrigerated. 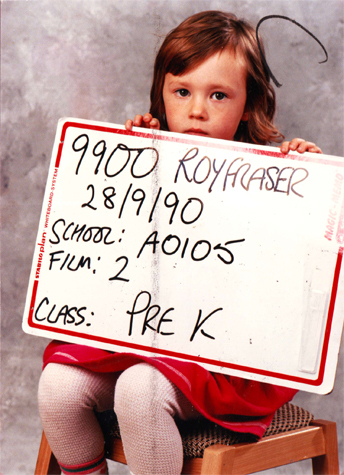 You might think I was very young here, but not really: I just didn't have much hair until I was three or four. Check out this fantastic floral ensemble. 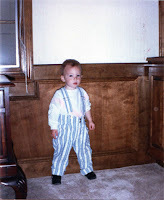 It was very hip to be covered head-to-toe in matching pattern in the late eighties. Although this outfit was apparently worn on numerous occasions, I am doubting my love of it, given the facial expressions in both of these photographs. 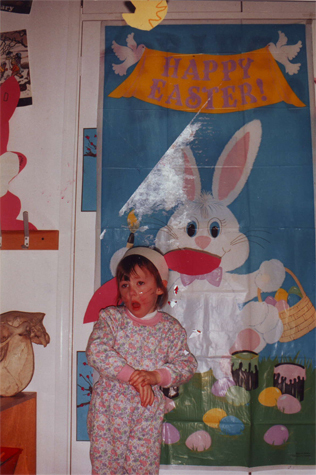 Four-year-old me was me was obviously very, very serious. I should be happier--I finally have hair! 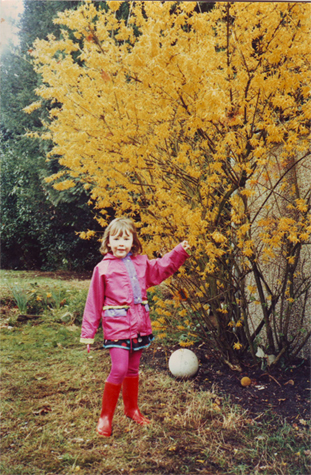 I'd also like to draw your attention to the blindingly pink outfit to the right, complete with bright red boots and what's that--a tree? What a lovely yellow tree that is. 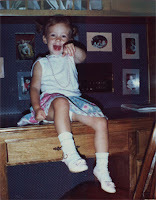 I'm glad you are pointing to it in such a casual way, tiny me. 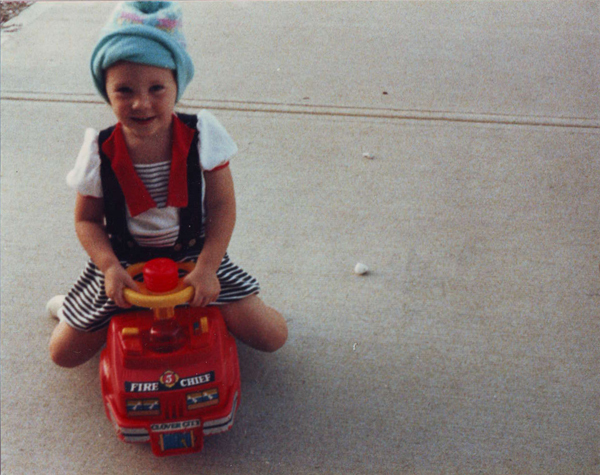 I always drove around on my fire truck wearing an over-sized toque and a striped get-up. That's how the Fire Chief rolls, yo. And on the right, you might be thinking to yourself that that picture is a bit inappropriate, given the bit of undie I am flashing. But that's nothing. THIS, on the other hand, isn't nothing. Good gravy. 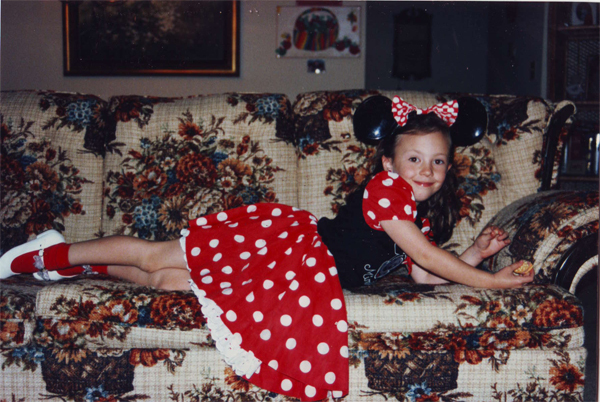 I remember acquiring this outfit in Disney World and insisting on wearing it all the time. 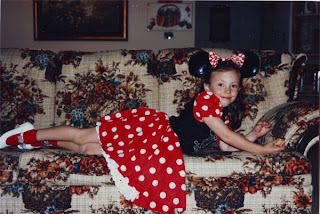 And I must commend my tiny self on the matching red socks/white shoes combination (even as a child, I was a fearless dresser), but somebody should have told me that respectable young ladies don't lounge on couches like that. And there you have it. Cutest tiny human ever? You've seen my undies now, so you might not want to say "yes", but you still have to.